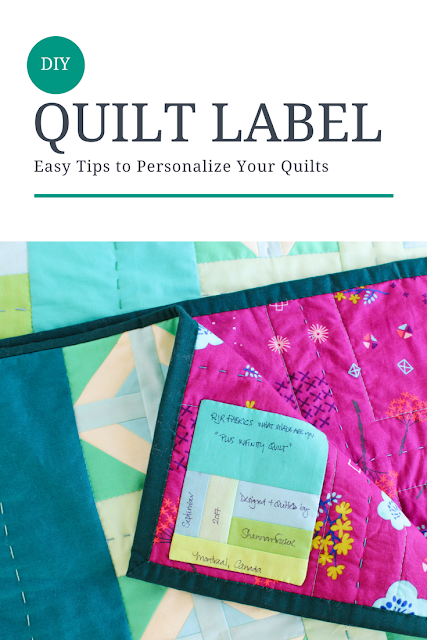 When I first started quilting, I remember hearing rumblings about the importance of labeling your quilt. 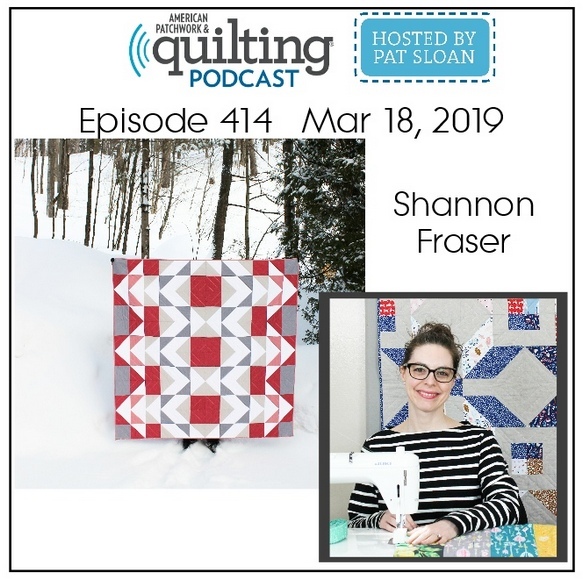 I even recall attending one of my first Modern Quilt Guild Meetings with the Montreal chapter and presenting my first ever quilt and as I was walking back to my seat several members mentioning how I just needed to label her! But the message stuck and I went on to spend A LOT of time researching quilt labelling options. PIN NOW TO TRY LATER! Be easy to pull together 😉 Did I mention that?! 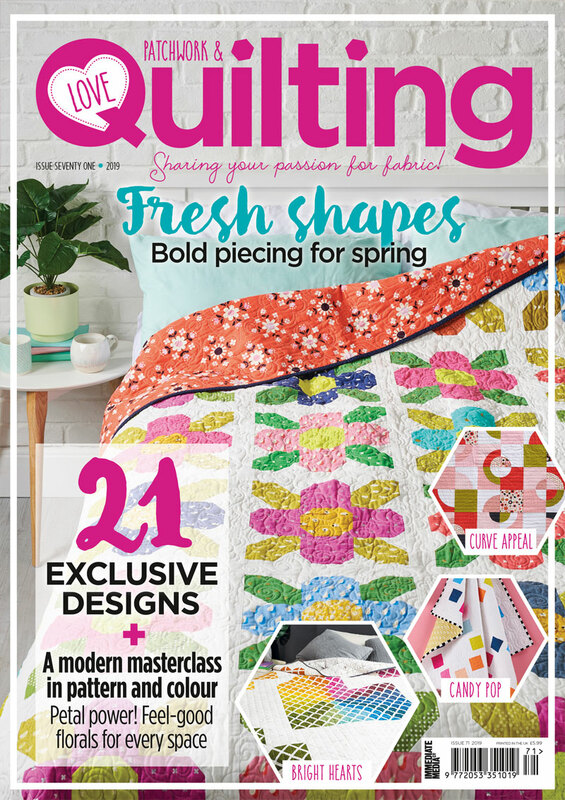 Quilting is supposed to be fun, so I’m not looking to get bogged down with steps that I don’t enjoy. But, I also recognize the value in adding a label. 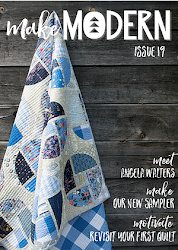 It lists all the important details of the quilt (more on that in a minute). It reminds me of what I’ve made – I’m getting older and it is amazing how time seems to blend together. If the quilt is gifted or sold, it tells the recipient the important stats of the quilt and who made it. 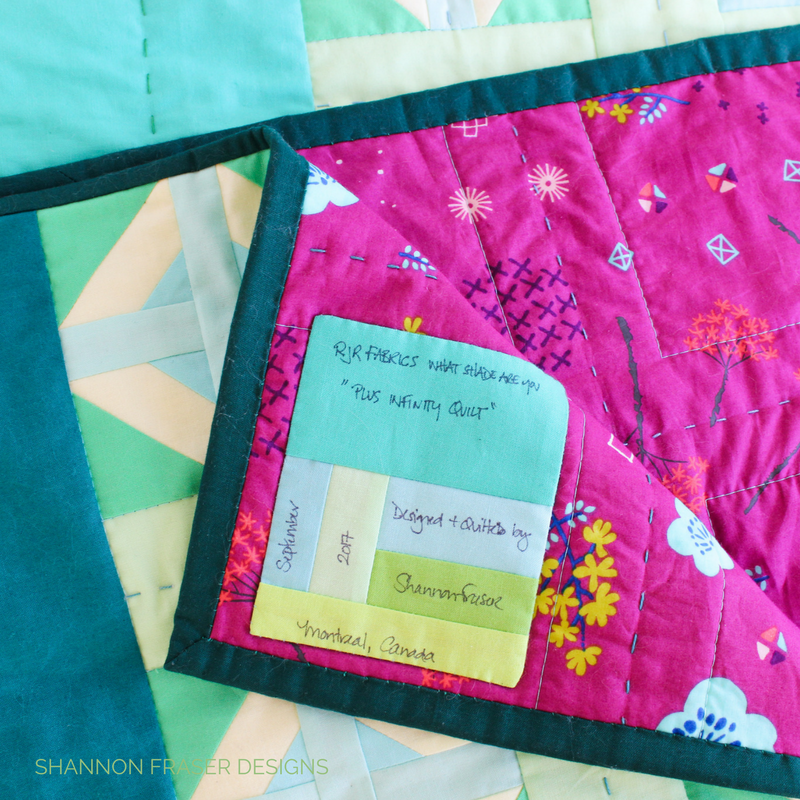 It adds a pretty and personal touch to your final handmade quilt. So those are my reasons for adding a label to all my quilts. After tackling a few quilt labels, I’ve actually come to love this step! Who knew?!! 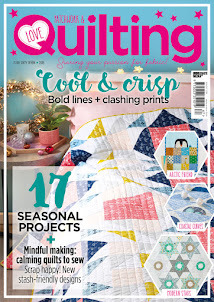 I would have never guessed it would become a favourite step in the quilting journey. 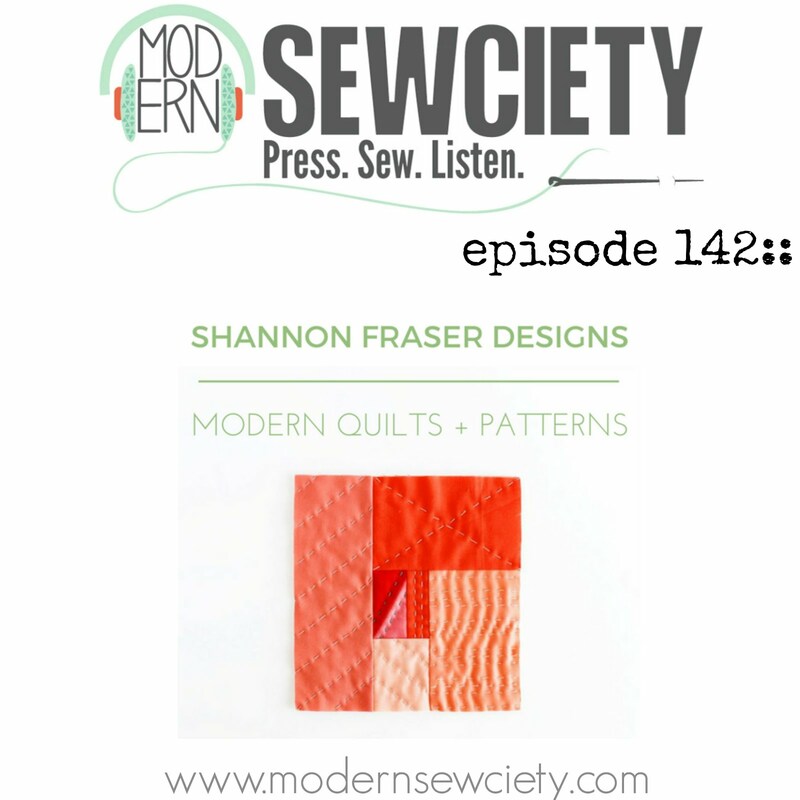 I now find myself thinking about the quilt label while I’m cutting fabrics for my project and/ or while piecing. Since I like to set my quilt project fabric scraps together in a pile, it becomes easy for me to sift through those little snippets for inspiration. 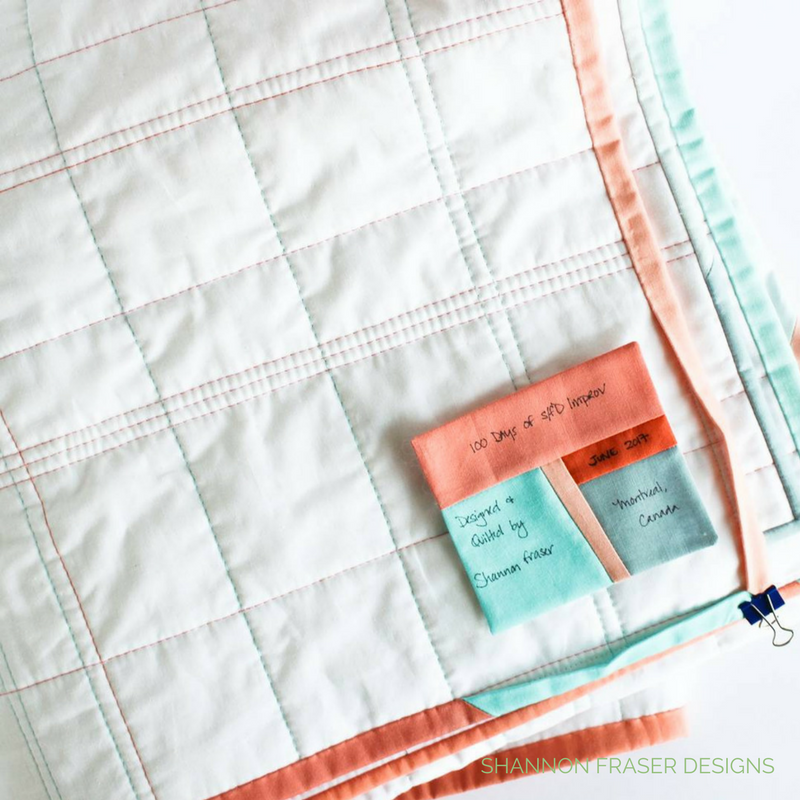 I typically use the quilt label as an opportunity to play and try out new designs, albeit on a small scale. 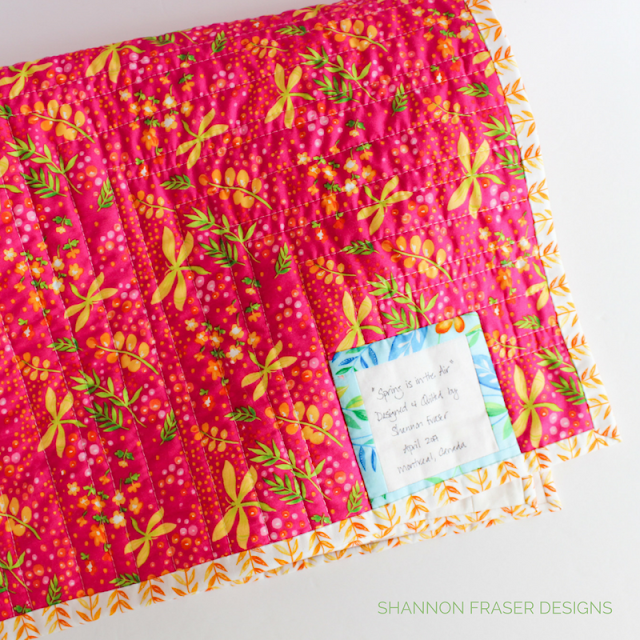 I love a good improv session, so I guess it’s no surprise that for my Plus Infinity Quilt, I opted to go with a modern improv quilt design. After sticking with the pattern on the front, it was nice to let loose and just experiment with the pretty colours. But there are lots of other design approaches you can use too. Try a block out in a mini version to see if you like the design. 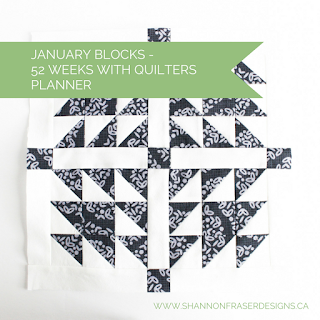 Play with colour placement and combinations to see if they would work on a larger quilt. Go with a simple solid. Go with a simple solid and add embroidery. Really, the sky is the limit and it’s all about exploring your own creativity. One of my favourite quilt labels was made using one print from the Playground Collection that I fussy cut to fit with the “playful” theme of the Playtime quilt. Isn’t she cute?!! 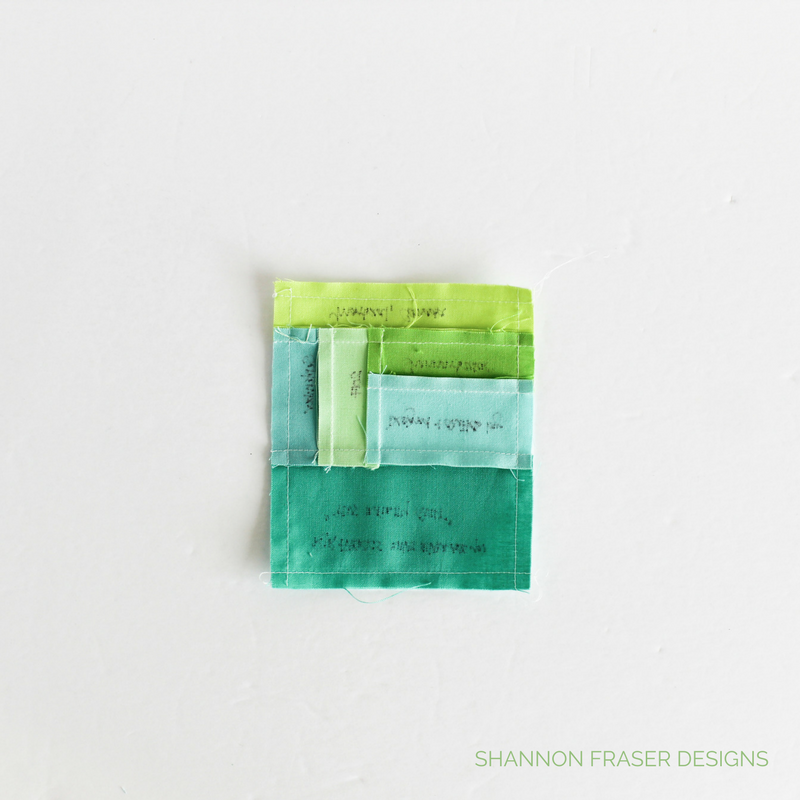 There are some key materials that you will need to tackle your own quilt label. First up is fabric!!! 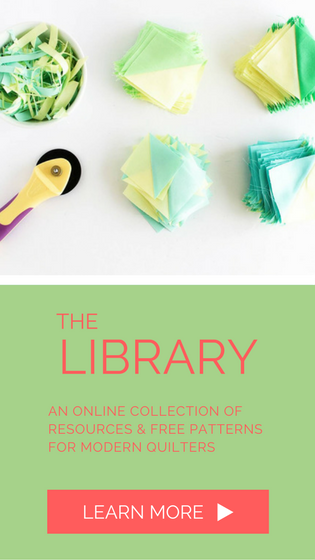 I like to use fabric from the quilt project, but you can use any fabrics your heart desires. This is a great project to raid your fabric scrap stash! Freezer paper. You should be able to find it at your local grocery store. I had to go to a few before finding my roll. You can also find it here online. 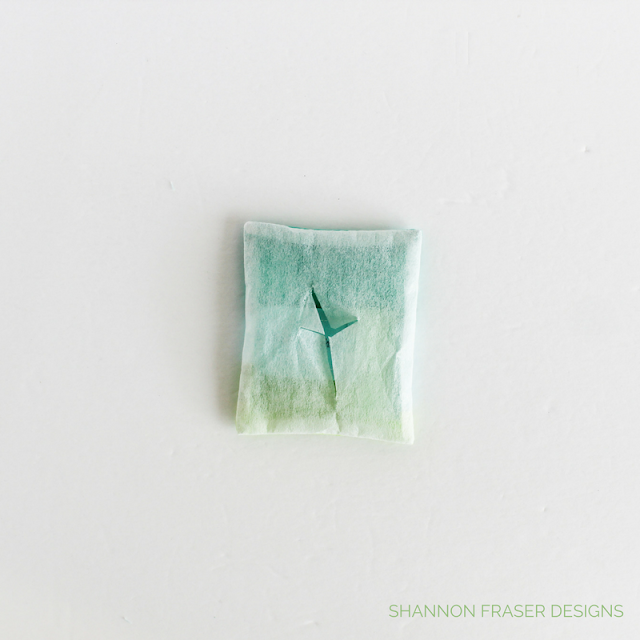 Thread (Aurifil 50wt is my go-to) and needle for attaching your label. Thread conditioner - this helps your thread glide through the fabric so it doesn't snag and tangles less. Once I have my quilt label pieced, I now need to prep her to be written on. What? Write on my label?! Yes, it works! I’ve tried using my ink jet printer to print out my labels, but I’ve had mixed success with this. Either my fabric somehow becomes a “paper jam” and gets all wrinkly or I’ve had ink smudge on other areas of the label making for a less than crisp outcome. Plus, when I changed printers it just wouldn't feed the fabric properly. So, to avoid this frustration, I moved onto writing on my quilt labels. To make the writing process go smoothly, I always start by backing my quilt label with freezer paper. This is the same first step you would use for using a printer (i.e. the freezer paper helps stabilize the fabric to get it through the printer). But I’ve found it beyond helpful when writing the details out by hand. Before I tried it, I noticed the pen didn’t move as smoothly over the fabric and it would get caught or the fabric would wiggle around, producing a wobbly written message. 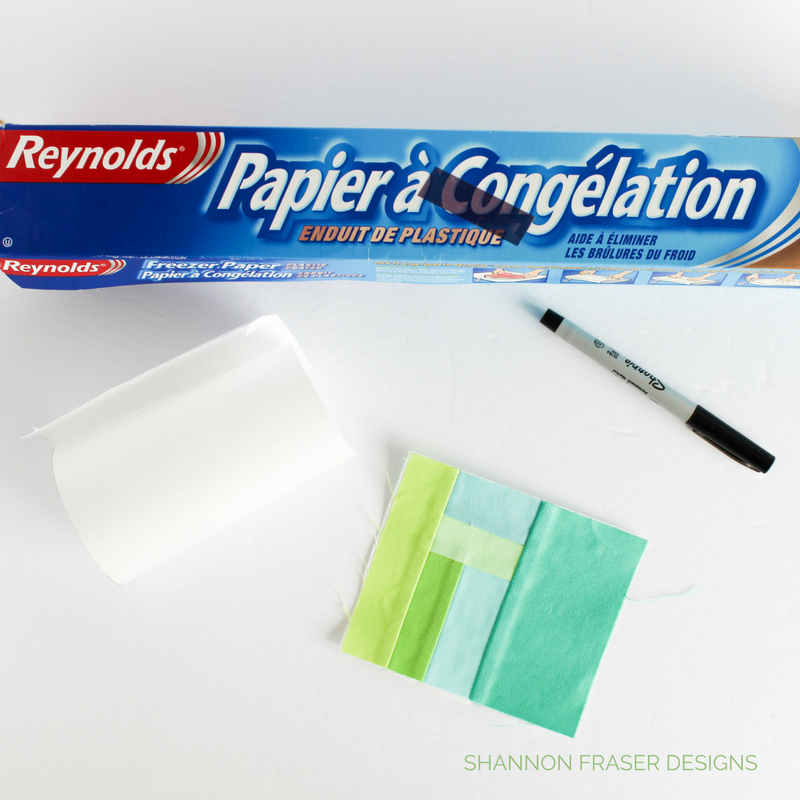 Freezer paper is super easy to use. AND it’s reusable! All you need to do is cut a piece that is large enough to accommodate the full size of your label. Iron it to the back of your pieced label, making sure to place the label wrong side touching the shiny side of the freezer paper. Also, make sure to iron with the right side of the label facing down (i.e. with the mat back of the freezer paper facing up). 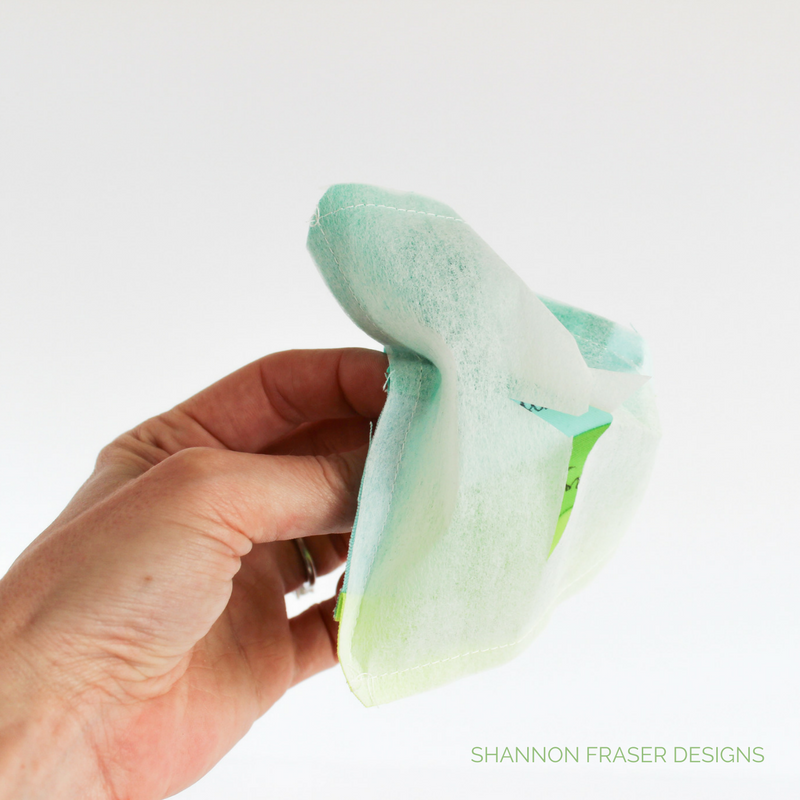 Otherwise, you will get sticky stuff all over your iron…and no one wants to have to clean that mess up! And, voila, you have a nicely stabilized quilt label ready to be written on. 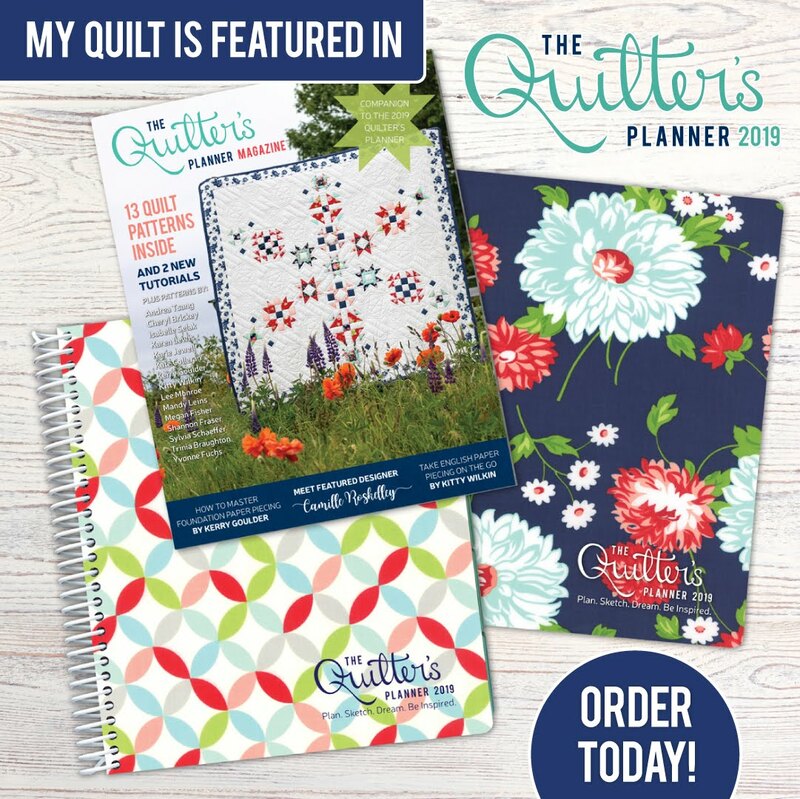 Note – most of the quilts I make are designed and quilted by me, so I typically write “Designed and quilted by”. Here is an example of a quilt label for a quilt I made using a pattern. WHAT DO I USE TO WRITE ON THE LABEL? I’ve tried a few different options here - regular Bic pen, Micron pen - and I always come back to an ultra fine tip Sharpie. Really! it works! Once I have everything written out, I set the ink with my iron. 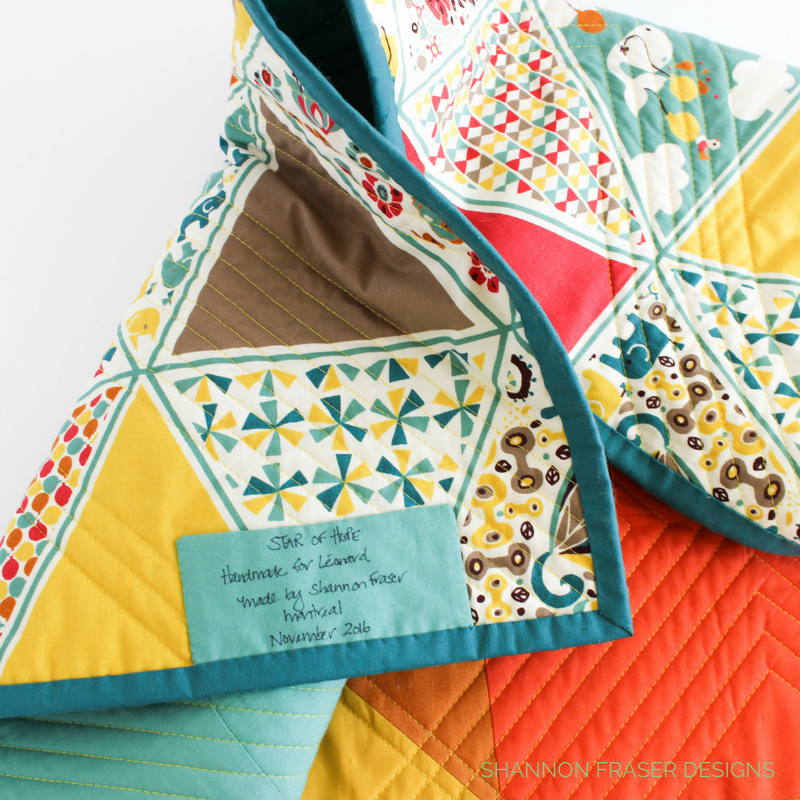 Ok, now that we have a nicely pieced and marked up quilt label, you’re probably wondering how to attach it to your quilt. At this point, you could just iron back a seam all around the perimeter and attach it by hand, but I find that too fiddly. 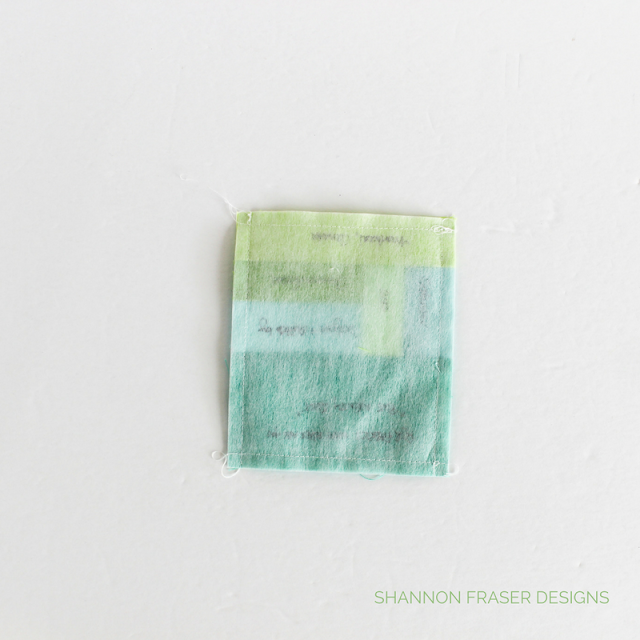 So, my go-to is to back the quilt label with a piece of interfacing. Nothing too heavy weight. 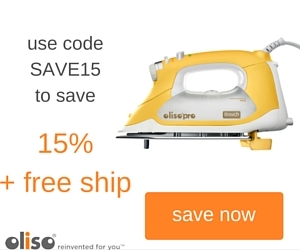 I am simply using it to enclose my seams. I also like interfacing that has a little adhesive on one side so I can iron it in place on the back of my quilt. Start by cutting a piece of interfacing the exact same size as your quilt label. 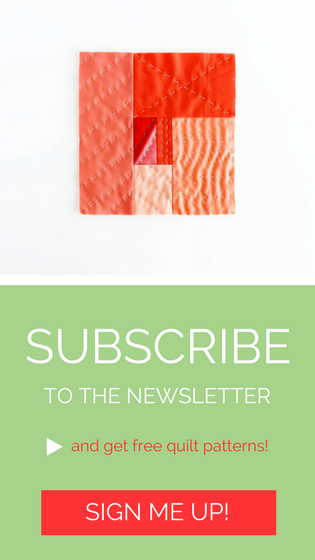 Place the two pieces right sides together and stitch a ¼” around the entire perimeter. Pull the interfacing away from the quilt label and cut an X in the back. Then flip the quilt label right side out. 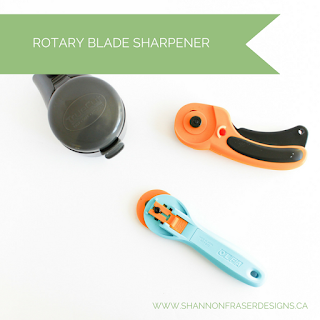 Use a Clover Slim Hera Marker to poke your corners out for nice crisp corners. Since I normally have the sticky stuff on the back of my interfacing, I iron everything out directly onto the back of my quilt. 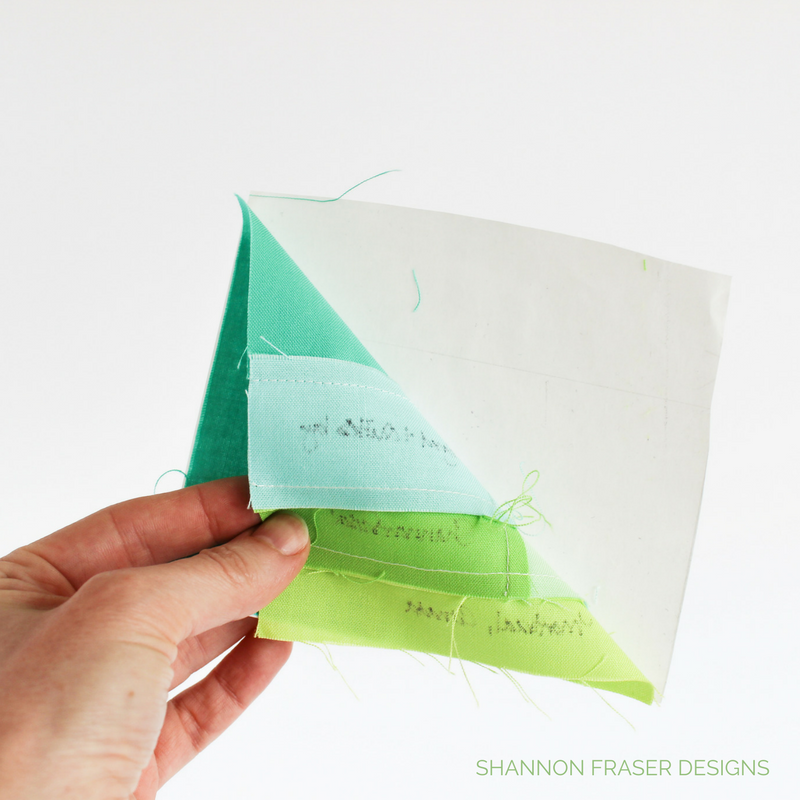 I then blind stitch it in place – using the same stitch technique I use for hand binding. 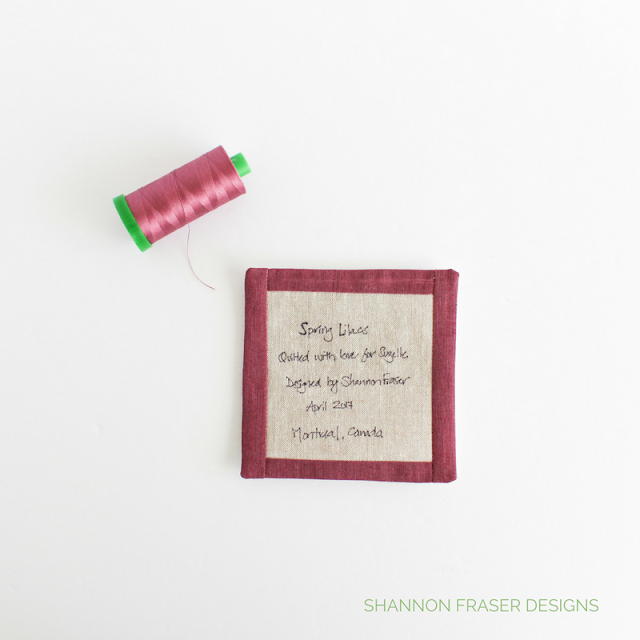 And there you have your very own personalized and unique quilted quilt label! Have fun with this. Be creative. Show your personality. Include a cute message. 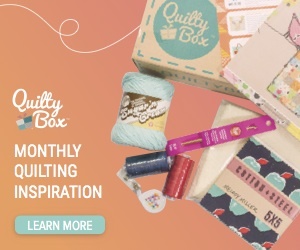 Whatever your heart desires, this is your way of signing your quilty masterpieces!! 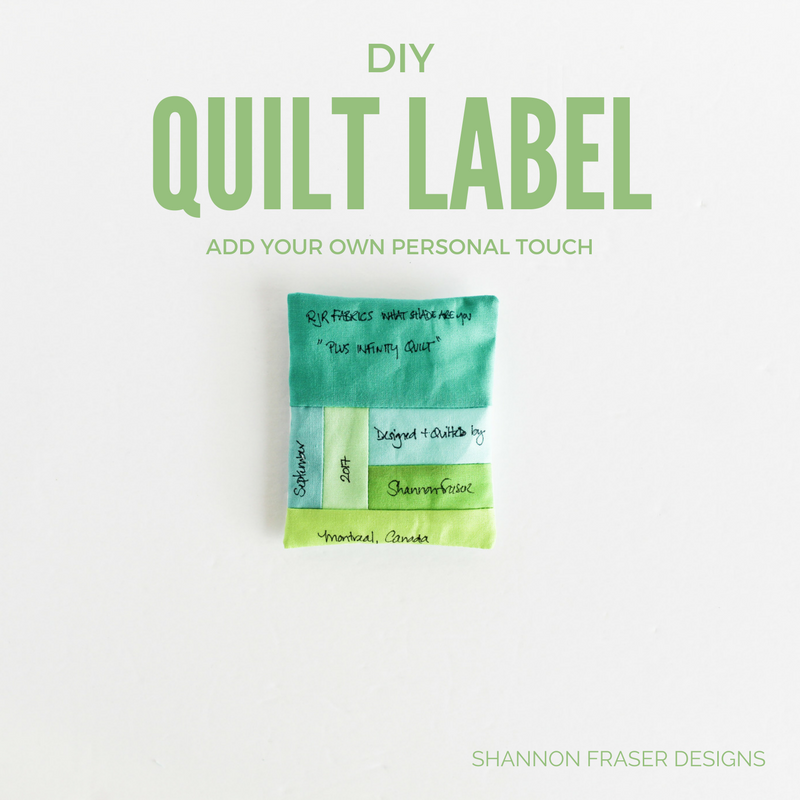 I would love to hear about your quilt label tips and tricks. Share them in the comments below!! This is lovely! What a simple yet efficient way to label quilts! 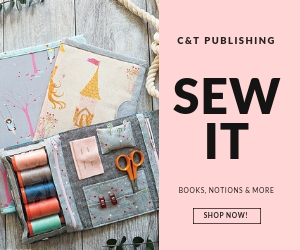 The interfacing is a brilliant idea and I bet keeps the corners turned wayyyy more securely than simply turning and stitching down. I always label my quilts, too--it's one of the very first things my quilting Grammy June taught me, and I'm always experimenting with styles. Thank you for this easy DIY walk through! I started by using name tapes that I had made up to say Handmade by Carie and then embroidering the year next to it. For quilts for the children I usually embroider a label and use the same interfacing trick to attach it - I've never tried just writing, mainly because my handwriting isn't that pretty!! I have a confession to make, Carie. I actually don’t love my handwriting! But it is what it is and I’m just trying to embrace that it makes the label uniquely mine!!! I love that you incorporate embroidery in your labels, such a beautiful touch! What a brilliant idea to use interfacing. 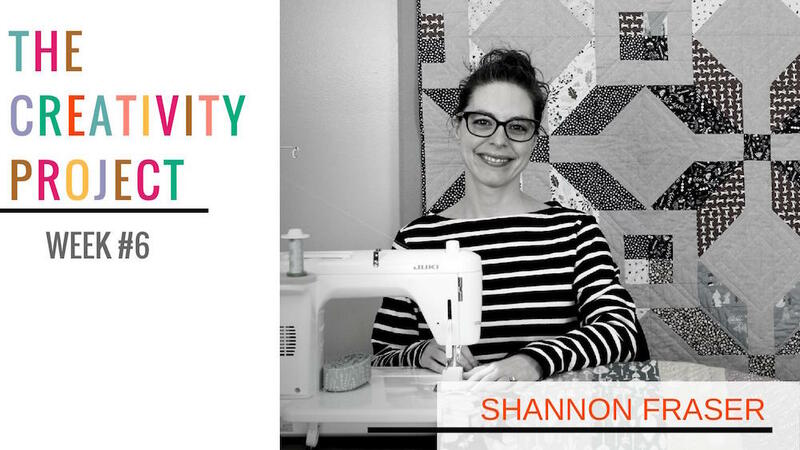 Great tutorial, Shannon! 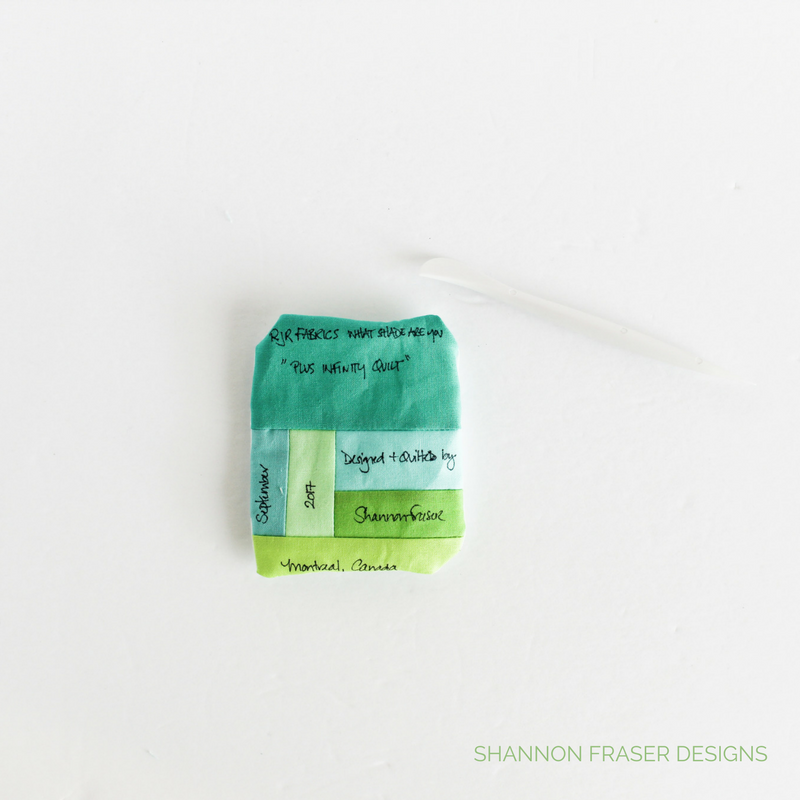 I use a similar technique to make labels, but the fusible interfacing is a great idea. I don't like my handwriting at all. I have printed the info off the computer and then traced the words. I like Comic Sans script. It is easy to trace. 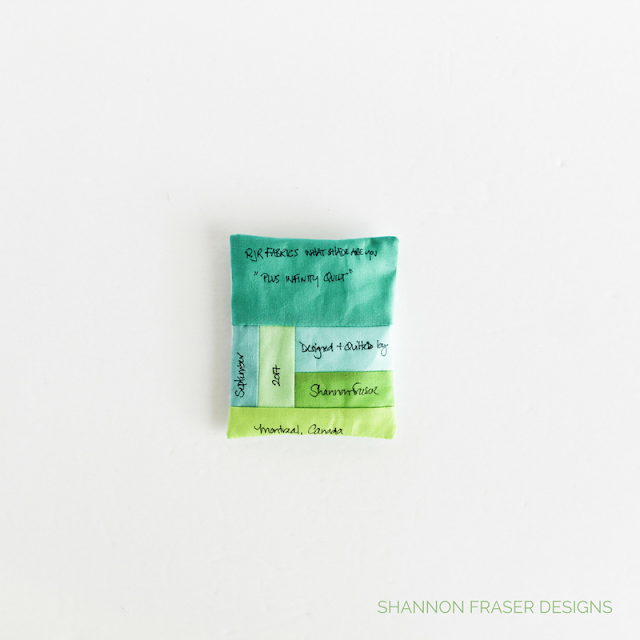 I’m so thrilled my fusible interfacing tip might come in handy for you!! I’m not a big fan of my hand writing either 😉 I normally reserve the tracing for embroidery, but might give it a try for my labels too!! Thanks for the tip! Thank you so much for these directions, it's exactly what I needed for my first quilt that I just finished. I LOVE it. Love your label ideas. I have been doing a lot of testing of permanent markers in preparation for a zentangle quilt. I observe that Sharpies are not permanent. The black will develop a yellow aura over time. The reds and blues bleed a great deal. Pigma microns come in various thicknesses and may be a better choice. So happy you like my DIY tips!! And thank you for sharing your marking experiments. I haven't had any issues, but I will keep an eye out for that yellow aura you refer to. I'll also look into thicker Micron pen tips! Shannon, I tried commenting before but I think the internet ate my words 😝! Anyway, I was saying I used to do quilt labels. 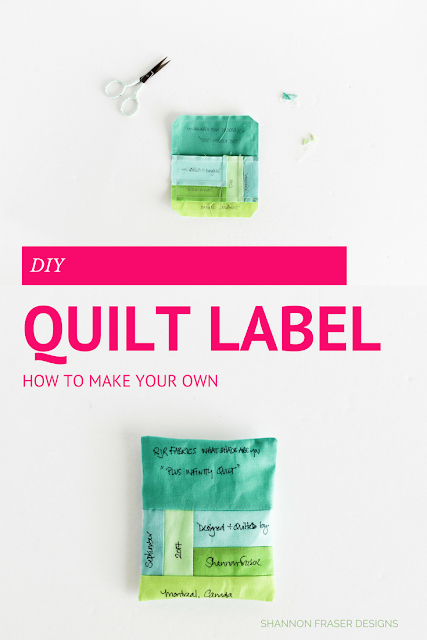 When I learned to quilt, the value of a label was impressed upon me. I've stopped in the last 4 months or so because that step was slowing me down, but I was embroidering my words instead of using a marker and treating it as an improv exercise. What a fabulous idea! I wonder if you have any issue with the Sharpie bleeding or fading over washes? I love the idea of embroidered labels! I’m just the slowest hand sewer that I think I would never finish a quilt using that method 😉 But I think it’s the prettiest and adds another layer of love that can’t be matched. I haven’t been quilting for that long to really know the longevity of using a Sharpie. But I haven’t experienced any bleeding or fading to date. I’ll be sure to share updates if I notice any mishaps with this approach. One person commented that they notice a yellow “aura” that appears around the black Sharpie. So, I may give Micron pens another go, if I can find a larger pen tip. 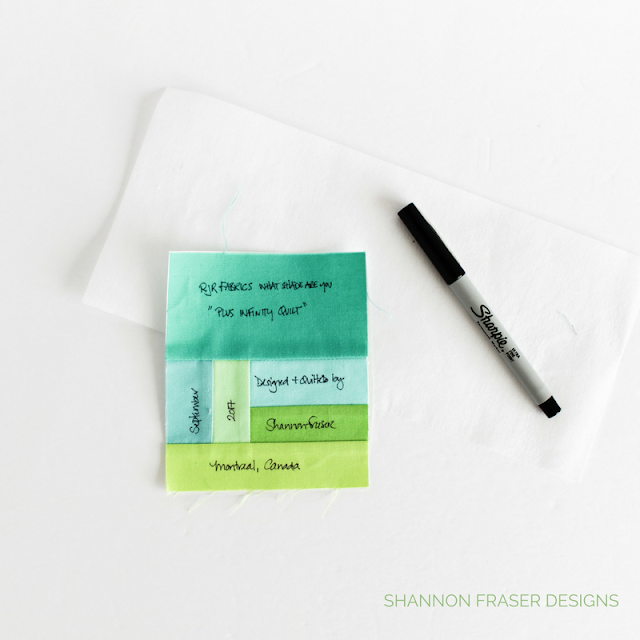 I love the tip to use interfacing, Shannon! I am hit or miss with labels depending on who the quilt it going to, but when I do, I also write and I use Micron pens. I'm so thrilled you love the tips! I'm even more thrilled that you will be giving it a go. 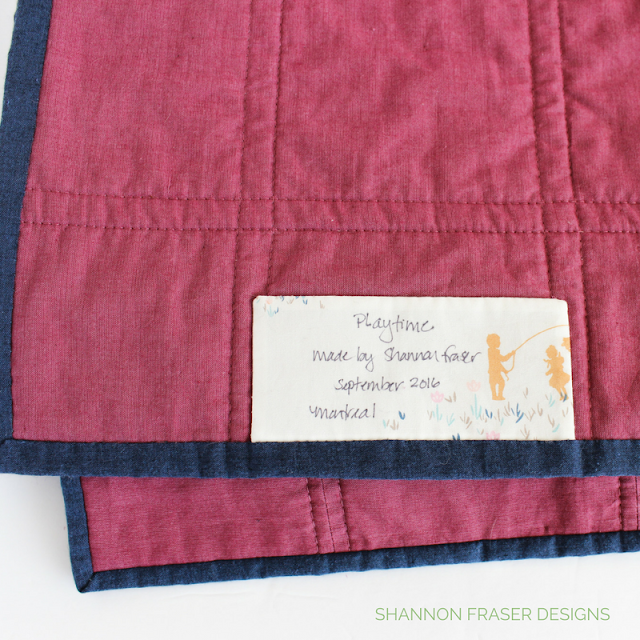 A handmade quilt label is such a nice way to finish off a quilt! What a great tutorial! I will start doing this too; thanks so much. I’m so thrilled the tutorial was helpful, Anne! Making your own labels is such a great way to add an extra personal touch to your quilts! Great label tuto! 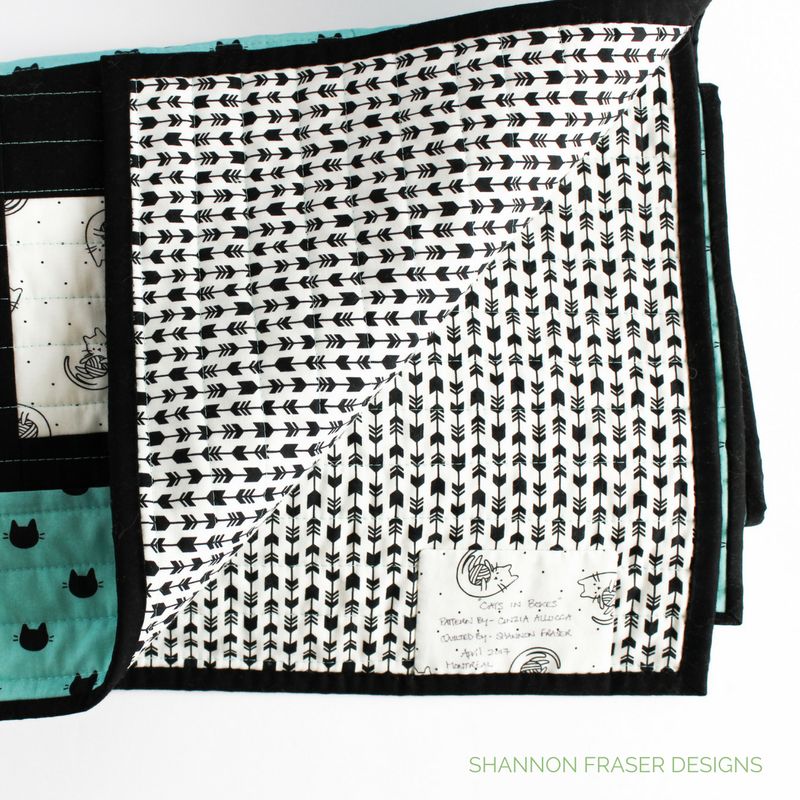 I love the way you attach it on the quilt with the interfacing, so clever, and neat!